Emergency crews were on the scene of a deadly crash for several hours Wednesday in Monroe, N.C., where a tractor-trailer overturned onto a Union County deputy's cruiser. The Union County Sheriff’s Office identified the man involved as Sgt. 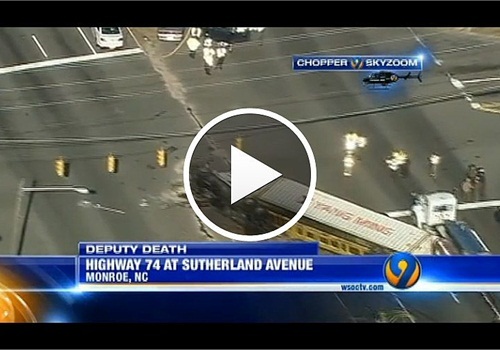 Jeffrey Wayne Greene, 54, reports WSOC-TV. According to troopers, the deputy was stopped at a westbound traffic light in the left turn lane with a Kia in the lane to the right and a tanker truck two lanes to the right. The tractor-trailer approached the intersection westbound and for unknown reasons was unable to stop. Troopers said the driver of the tractor-trailer made an evasive maneuver to the left to avoid slamming into the back of the tanker, which caused the tractor-trailer to overturn. It landed partially on the Kia and more directly on the deputy's car. Troopers said the deputy died on scene in the cruiser.